As the local gravel road gurus, we've chosen the safest and most scenic routes possible that will challenge the most competitive and adventurous alike. 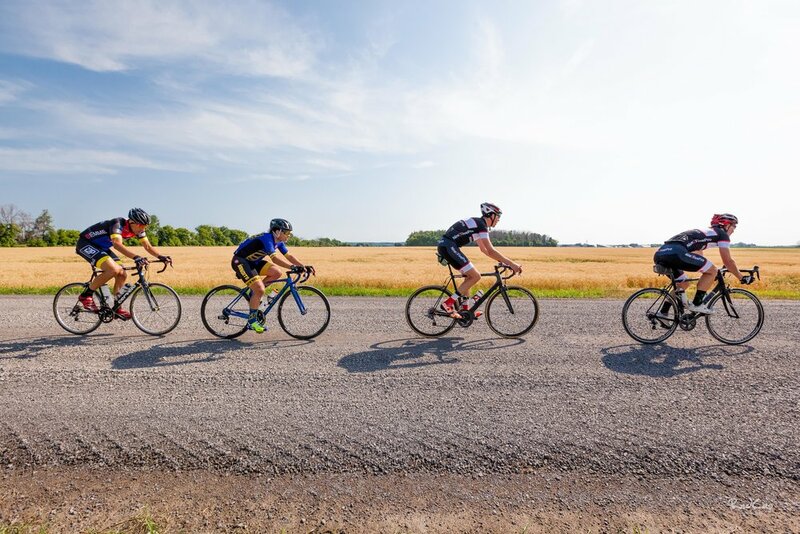 The gravel roads of West Carleton are in excellent shape and most of the course can be ridden on 28mm tires. It's only the short 300m Needhams Side Road unmaintained Road Climb where 32mm+ tires come in handy. The race headquarters are located at the Kinburn Community Centre which has ample parking and facilities. After short neutralized sections, the events will begin, starting strategically in places where the more competitive riders can separate themselves and the adventure riders can ride at their own pace. The events will be accompanied by a small event caravan equipped with floor pumps, water, and an assortment of gels. At approximately 2/3 completion, there'll be a refuelling station for those wanting to rest for a bit. The course will be marked with highly visible red arrows and the lead vehicles will provide rolling marshalling at strategic turns and crossings. The two-day standings will be decided by a points system as shown. The tiebreaker will be the highest placing in one of the two events. Euro-Sports Ottawa has generously donated $500 to the overall prize purse (top 5 finishers) and 100% of women's entry fees will be put towards the Open Women's prize purse (top 3 finishers). It is NOT required to compete in both races. Points will stand regardless of whether you participate in one or both events.